When you’re ready to take things to the next level, the 9000 Series is your SPFH. Think top of the line crop analysis and documentation capabilities, peerless forage quality with an exceptionally robust kernel processor – all powered by a true goliath of an engine. Go ahead and take your business further. 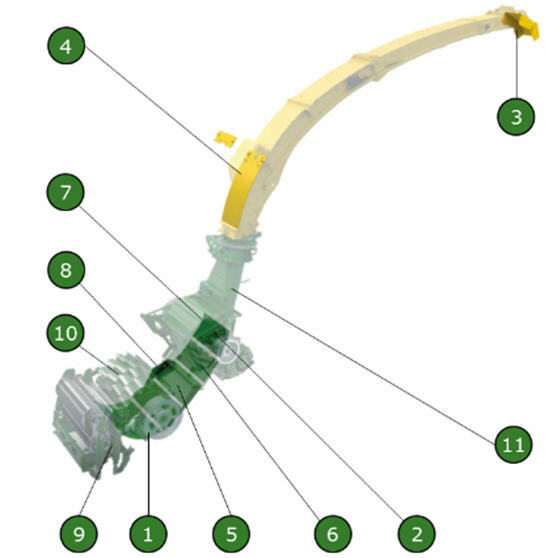 John Deere rotary harvesting units are built for reliable and powerful feeding of high-capacity forage harvesters. Two fundamental designs are available to match all producer needs. The 300plus Series Headers are the universal solution for different crops up to 4-m (13.1-ft) tall. The 400plus Series Headers are the perfect solution for high-yielding crops. Available beginning in model year 2019, the top-model 490plus 12-Row Large-Drum Rotary Harvesting Unit has been designed to fully leverage the capacity of 9000 Series Self-Propelled Forage Harvesters (SPFH). The 6X9 Series Pickups with the patented endless flight auger design and optional dual header drive enable high-capacity feeding of John Deere SPFH. Key advantages are the throughput boost in high-yielding crops but also the easy handling of uneven windrows. John Deere SPFH come with variable header drive in base. The header speed is automatically synchronized with the feeding speed and length of chop through a hydrostatic IVT™ drive system. 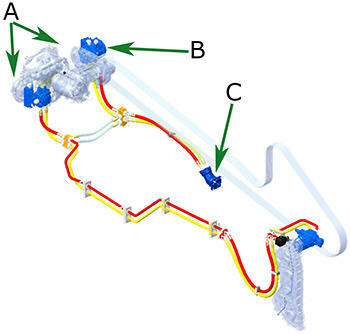 This ensures a gentle and even crop transfer from the header into the machine without blocking or disrupting material transition. Producers receive the benefit of high chopping quality and full leverage of the header and crop flow potential. Dual header drive for the SPFH and the 6X9 Series Pickups complements the benefits of the variable header drive. While the variable header drive automatically synchronizes the pickup auger and harvester feeding speed, the dual header drive with its individual hydraulic drive of the pickup tines is speed matched with vehicle speed to ensure clean crop picking in changing conditions and windows. Tines speed up and slow down with forward speed while the pickup auger speed is still synchronized with the length of chop and feedroll speed. Producers benefit from a better quality of chop, smoother feeding, and an easy-to-utilize harvesting system. A state-of-the-art metal detector scans for metal in the crop mat and stops the intake in case of tripping. Optionally, this safety device can be completed with a unique stone detection feature that senses for knocks and abnormal feedroll movement. Two redundant sensors developed for this application improve solid foreign object detection and minimize false tripping caused by lumps or uneven windrows. The 9000 Series SPFH offer the hydraulic feedroll dampener in base. 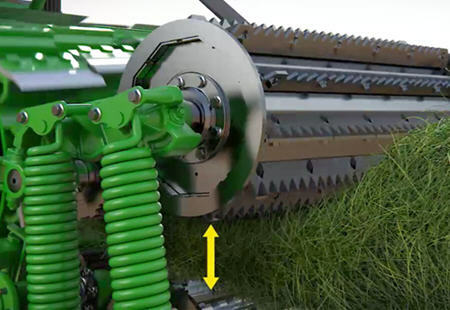 Next to the four individual springs applying high pressure on the crop mat entering the machine, the dampener supports crop compaction in uneven crop conditions and ensures smooth feeding even at the highest feeding speeds when chopping for a very long period. All 9000 Series Self-Propelled Forage Harvesters (SPFH) can be operated with or without a kernel processing unit in position. When not in use, a crop transition chute swings into position at a few turns of a crank. The crop transition chute comes standard on all harvesters. Also available on all SPFH is the optional dismounting crane for easy kernel processing swing outside the service compartment. 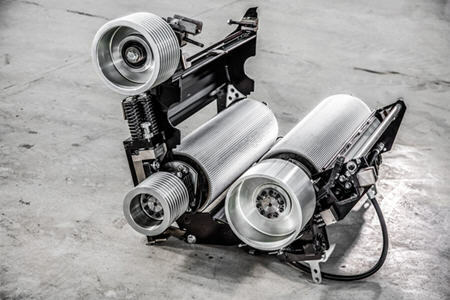 The 9000 Series SPFH feature the AutoLube central greasing harness; the respective central greasing equipment is available on the Premium Kernel Processor as well. The XStream Kernel Processor features an automatic pressurized oil lubrication. 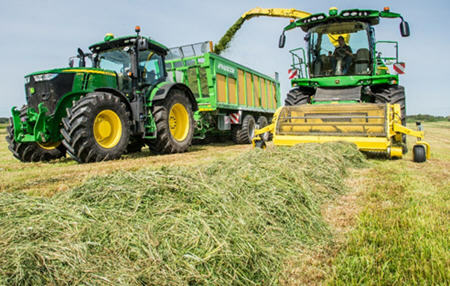 For the 9000 Series, two types of kernel processors (KP) are offered: the John Deere Premium KP and the John Deere XStream KP. Both kernel processors have been tested and proven by independent experts during corn harvest in 2016 and 2017. 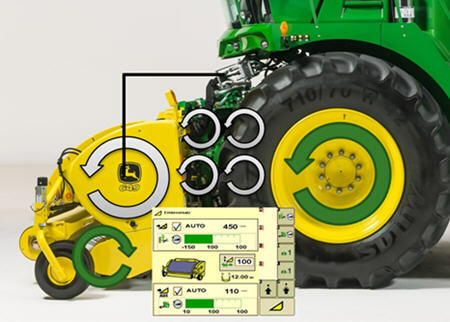 The 9600, 9700, and 9800 SPFH can be equipped with the John Deere XStream KP or the John Deere Premium KP. For the 9900, only the heavy-duty XStream KP solution is available. 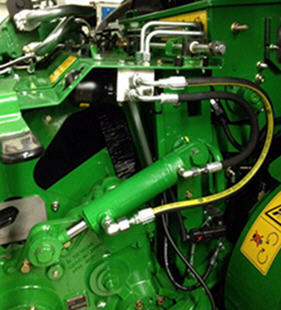 On the 9000 Series, the proven John Deere Premium KP can be installed on the 9600, 9700, and 9800 models. With their highly intense processing, they deliver the best results at any length of cut. The Premium KP has a standard KP housing with grease lubrication in base. The roll diameter is 240 mm (9.45 in.) with 32 percent speed differential. As an option, 40 percent speed differential can be installed, if required. With the option of Dura Line rolls, a longer lifetime and less wear can be reached, resulting in less cost of operation. For an easy and uncomplicated mounting and dismounting of the Kernel Processor, a crane with electric winch can be installed as an option. 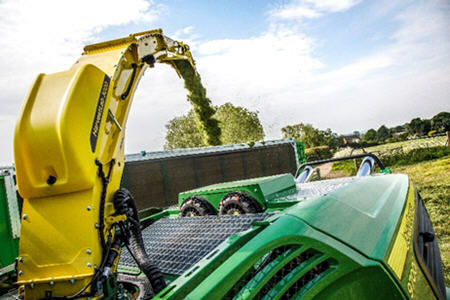 The John Deere XStream KP is made for high-horsepower machines and stands for extreme kernel processing at any length of cut. The XStream KP rolls are manufactured and delivered by Scherer Inc., which is located in South Dakota, Unites States. The kernel processor is supplied ex factory by Scherer Inc. and fits all 9000 Series models (9600 through 9900). As Scherer Inc. has a strong focus on dairy forage production and is the leading company in KP roll designs and manufacturing since 1999, a strong statement is set in regards to kernel processing and forage quality. The XStream KP is equipped with a heavy-duty housing with KP roll quick-exchange system and pressurized oil lubrication. The roll diameter is 250 mm (9.8 in.) with 50 percent speed differential. As an option, the XStream KP can be equipped with bearing temperature monitoring. In comparison to the Dura Line sawtooth rolls, the Dura Line XCut rolls have a spiral groove sawtooth profile, delivering excellent processing, especially at long lengths of cut. The spiral groove design delivers highly processed plants and smashed kernels. Due to a special heat treatment, the coating is extremely wear resistant and has an extraordinarily smooth surface. This results in a permanent fast chopping process while the fuel consumption remains low. Tests show that while chopping in the same crop conditions and chopping the same tonnage, Dura Line parts last four times as long as, or longer than, standard parts. Time and money associated with replacing parts are significantly reduced. Performance – an extremely hard coating makes Dura Line wear parts the toughest. 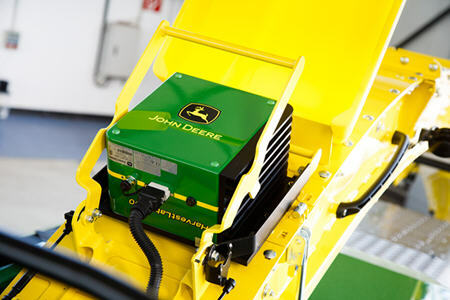 Dura Line is exclusively supplied from John Deere. Uptime – Dura Line uses a unique technology that provides more hours of extensive machine use before parts need to be replaced. A proprietary tungsten carbide composition associated with unique application provides this exclusive wear-resistance performance. Cost of operation – premium John Deere parts last up to five times longer and cut labor costs. This significantly minimizes the risk of downtime during the harvesting season, saving money in the long run. Dura Line parts cover nearly every wear part that does not already have a high-wear solution. The main crop flow elements are hardened and more resistant, even in the toughest conditions. Dura Line parts include spiral band, knife brackets, front chute, grass channel blower band, blower side liners, spout liners, and spout caps. 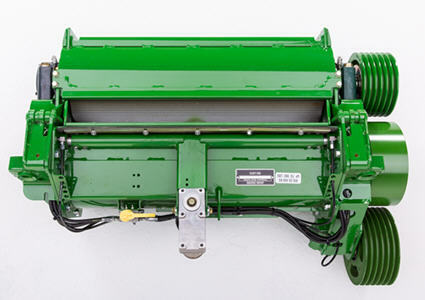 Producers have the ability to equip their 9000 Series Self-Propelled Forage Harvesters (SPFH) with Dura Line components for extended part lifetime and lower cost of operation. The HarvestLab sensor mounts to the top of the discharge spout and takes accurate dry matter and ingredient readings (more than 4000 measurements per second) of the crop through the sapphire glass lens as crop passes through the spout. This is the same technology forage labs use to measure dry matter. HarvestLab with John Deere Constituents Sensing measures dry matter, and has the ability to measure sugar, starch, acid detergent fiber (ADF), neutral detergent fiber (NDF), and crude protein in corn silage as well as ensiled material when used as a stationary unit. When HarvestLab is used in conjunction with Harvest Monitor™, a wealth of important information becomes available to the operator, including productivity in acres per hour, throughput in tons per hour, total area harvested, total crop mass harvested, yields, and dry matter. When the HarvestLab is used in conjunction with an 8000 or 9000 Series Self-Propelled Forage Harvester (SPFH) and a GreenStar™ display, AutoLoc™ functionality is automatically present. AutoLoc automatically varies the length of cut according to the desired crop-dry matter correlation settings based on the dry matter readings from the HarvestLab sensor.